The proceedings can be found here. Keynote presentations can be found here. A general conference overview can be found here. 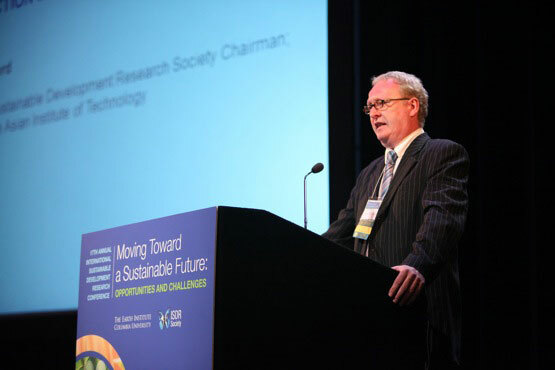 The 17th annual conference of the International Sustainable Development Research Society (ISDRS) was hosted by the Earth Institute, Columbia University, in partnership with the United Nations Division of Sustainable Development (UNDSD) and the Asian Development Bank Institute, in New York, New York, USA from 8-10 May 2011. The conference theme for 2011 was “Moving Toward a Sustainable Future: Opportunities and Challenges.” Within this theme, the 17th annual International Sustainable Development Research Conference (ISDRC 17) explored the fundamental question of how global society's aspiration to continued growth can be harmonized with the existing limits imposed by Earth’s resources. ISDRC17 explored how progress in the field of sustainable development can be translated into political action through a dialogue between scientists and stakeholders. The third day of the conference included a dialogue between conference attendees, decision makers, policymakers and the private sector. Scientists from academia and other research entities heard firsthand about the type of information needed by stakeholders while stakeholders and policymakers were informed of the state of the science of sustainable development. The results of the conference will be summarized in a white paper prepared by the scientific committee to inform the United Nations Conference on Sustainable Development Earth Summit 2012 (Rio+20). The conference explored what it would take to master the challenge of sustainable development in a future with increasing constraints, assuming that developing countries will continue to strive for improvements in their standard of living. At the same time the conference examined opportunities and mechanisms through which global society can move toward a sustainable future. Participants discussed the nature of the global sustainable development challenge including investigations of fundamental pressures on natural and socioeconomic systems in a developing world, limits of Earth to support further development, and solutions to the problems created by continued development of a growing global population. The conference was a forum for open and diverse intellectual discourse on these topics with focus on identifying steps toward a sustainable future that are ready for implementation on the local, regional and global scale.